Whenever the next recession does arrive, what we know today is that it is unlikely to be a "normal" recession, by the standards of what most people have experienced in their lifetimes. In this analysis, we will compare and contrast the characteristics of an average recession based on 164 years of history, versus what has been experienced in the United States since the end of World War Two. 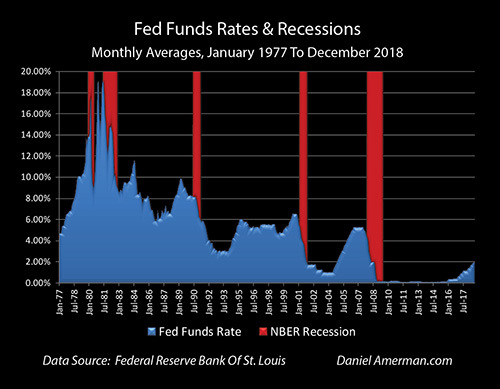 For most of the modern era, we have experienced unusually short and infrequent recessions, specifically because of how Federal Reserve interventions have changed the business cycle. The issue for investors in general and retirement investors, in particular, is that the Fed is trapped inside of a box of its own making, and it appears highly likely to enter the next recession without the necessary tools to exit that recession in the way that most people now take for granted. What history shows us is that lacking those interventions, recessions become more frequent, average recessions become much longer, and the average investor - and retiree - likely spend twice as much of their lifetime in recessions. Indeed, as explored herein, what 164 years of economic history show us is that the so-called "Great Recession" of 2007 to 2009 was not an aberration, but was merely average. If the United States were to return to the long term averages for what recessions have been when the Fed lacks the necessary "ammunition" to quickly exit a recession - then we could expect a new "Great Recession" about once every five years. 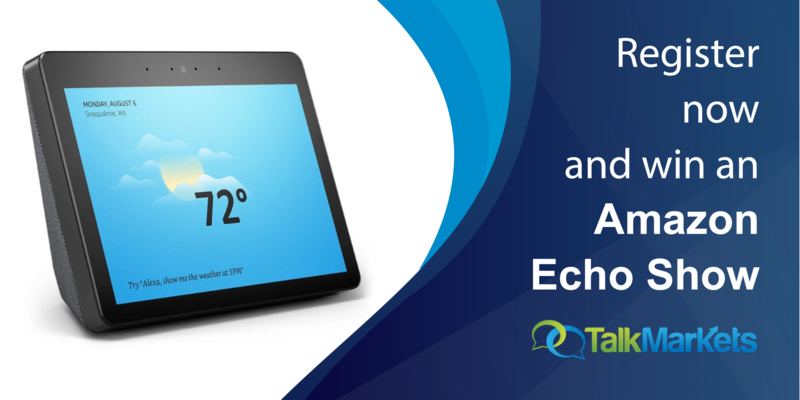 This then has potentially extraordinary implications for future investment results, as well as financial and retirement planning. 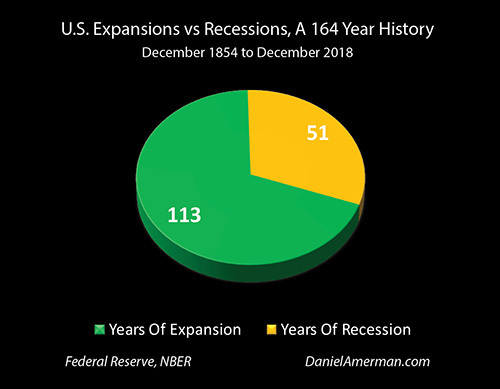 As explored in a previous analysis in this series (linked here), over the last 164 years we have seen 34 cycles of recession and expansion in the United States. 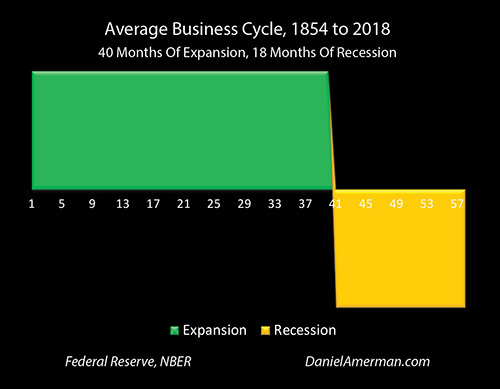 This business cycle could be likened to the natural cycle of nighttime and daytime: the sun has gone down 34 times in the form of recessions, and the sun has then come up 34 times in the form of expansions. 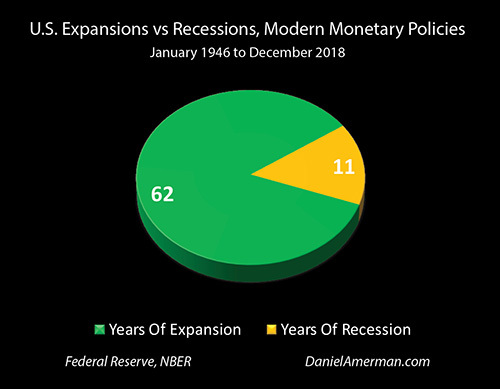 However the since the end of World War II we have seen a quite different and visually obvious change in the frequency and duration of recessions versus expansions - the green areas of expansion are "fatter" and of longer duration, the gold areas of recession are thinner and less frequent. As covered in the prior analysis (linked here) and as can be seen above, the Federal Reserve has been following a monetary policy of responding to recessions in process (or the imminent threat of recessions) by rapid and major reductions in interest rates, and it has been doing this with 100 percent reliability. This consistency is because smashing down interest rates is the Fed's sole historically proven tool for reducing the length of recessions (or at least the sole major tool). Whenever we enter a recession, the Fed essentially swings a sledgehammer downwards (there is nothing subtle about this process), and by this application of brute force, they attempt to jolt the economy out of recession. 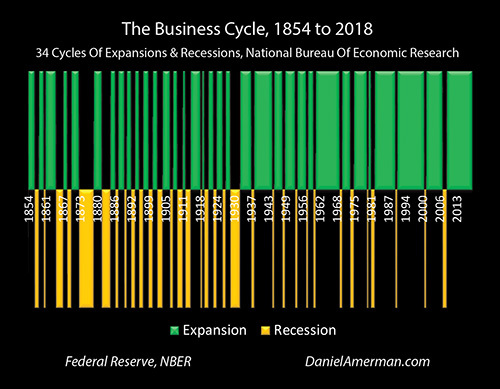 As can be seen on the right-hand side of the green and gold graph of the 34 cycles, what we've been getting over the last about 70 years is shorter and less frequent recessions than was the historical norm over the entire period since 1854. Because this material change in the business cycle has been true for most or all of our lifetimes, this has now come to be viewed as the natural recession cycle by people. They believe that this is just the way expansions and recessions work - however, that's not actually the case. Instead what we have experienced is a change in the natural recession cycle that is highly dependent on the modern Federal Reserve interest-rate cycle. Since the Federal Reserve has adopted these modern monetary policies - with the most important one being the application of brute force through dramatically slashing interest rates - we've seen a major change in the characteristics of the average business cycle. 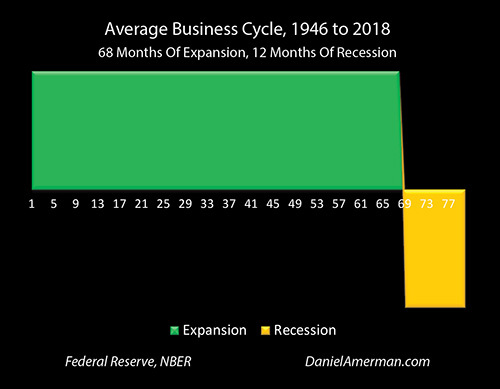 Since 1946 and the advent of modern monetary policies, recessions have on average occurred less frequently: we have moved from the 58-month average business cycle that is shown in the top graph, to the 80-month business cycle that is shown in the bottom graph. The recessions are shorter, we moved from an average of 18 months to an average recession of 12 months, which is a decrease of 33 percent. The expansions are longer, we moved from a 40-month average expansion to a 68-month average expansion - which is an increase of 70 percent. If we compare the relative number of years that are spent in recession versus expansion, then as shown in the two pie charts above, there has been a drastic change. Over the entire 164 years, we could on average expect to spend about 31% of our lives in recessions and the remaining 69% would be in expansions. Since the end of World War II - when the Federal Reserve began its policy of smashing interest rates down by a very large extent every time they believed a recession was either underway or imminent - the time spent in recession is down to about 15 percent, with about 85% of our lives spent in expansions. Again many people now view this 85/15 ratio as being natural - if that. As covered in the first "night and day" analysis, when it has been a long time since the last recession, many people stop believing in recessions at all, and millions of people can (this happens every time in the modern era) begin taking major financial risks because they have convinced themselves that it will be 100% expansions / 0% recessions from here forwards, and nighttime will never return - the previous 34 sunsets notwithstanding.